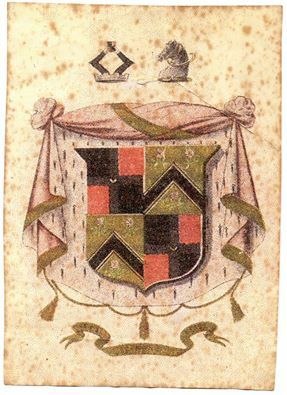 There are two coats of arms associated with the Rudge family. The first is associated with the Evesham branch of the Rudge family; the second is associated with the Gloucester branch of the Rudge family, whose connection to the Evesham branch is uncertain. The latter was brought to my attention by Michael Rudge, a descendant of the Gloucester branch. "The Arms of Rudge an ancient of long residence in the counties of Glouster and Worcester, viz. Arms (shield)/Crest description: "Quarterly, table and gules. A cross grailed argent, charged with a crescent for difference of house. 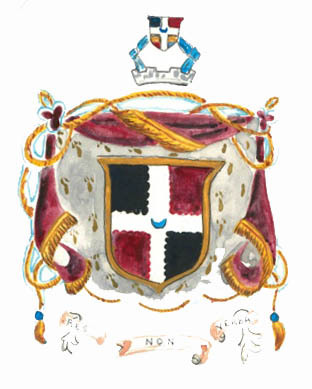 Crest and out of mural crown. Two arms embowed in armor, holding an escutcheon charged with the same arm. Blue horzonal. Red vertical. Black vertical and horizonal." "